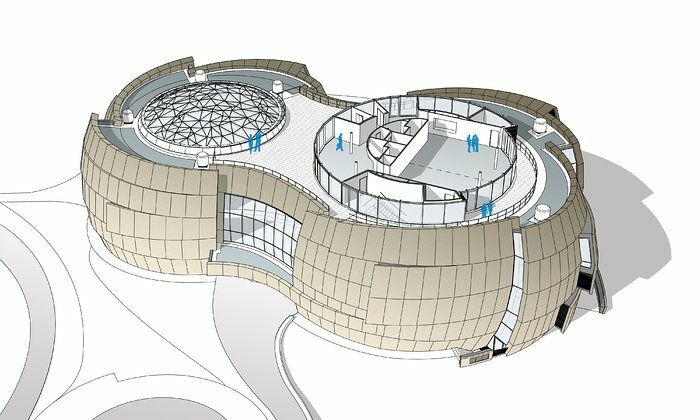 The ESO Supernova Planetarium & Visitor Centre, being built in Garching next to the ESO Headquarters, will offer its visitors a contemporary, interactive exhibition on modern astronomy, as well as the possibility to enjoy digital full-dome planetarium shows and guided tours. This floor plan shows the uppermost floor of the building. The large glass dome of the Void can be seen on the left; on the right — above the planetarium — the seminar room is located, which can be separated into two rooms by a movable wall. Around the seminar room a rooftop terrace can be used to relax in between workshops or to enjoy the view of the site.